A truly special member of our family has passed on. Dash was a 13-year-old greyhound who faced many challenges over his lifetime with courage and strength. He was the second rescued racing greyhound we adopted, some eight years ago. We were told Dash and others in the racing kennel were routinely kicked when they did not perform well. He came to us with an injured shoulder. But he survived the horrors of racing, where so many others never make it out alive each year. So many never make to it their senior years. Several years back, we discovered a lump on the base of his ear. The diagnosis was fibrosarcoma and the ear had to be removed to save his life. Some time later, he faced another health crisis and it was determined that his spleen needed to be removed. The surgeon found the spleen was damaged, most likely from an injury suffered in racing. The night after the surgery, he suffered a bout of bloat and had to go back in for another emergency surgery. But again, he came out like a trooper, with grace and courage. About a year ago, he began to have an increasing level of difficulty with weakness in his lower back and rear legs. Earlier this year, he lost complete use of his rear legs. But still, it was clear that his will to live was unwavering. So for months, I picked Dash up everyday to take him outside to enjoy the grass and fresh air. He had his spot during the day on his bed and every night he napped beside my wife on the top deck of a living-room daybed while she watched her favorite TV shows. Dash adjusted incredibly well to each challenge he faced in life. It was clear until the very end that he still enjoyed a quality of life. He loved to be close to my wife and loved for me to rub on his one ear. Over the last few months, I was getting up once or twice each night to turn him, so that he wasn’t laying on one side too long. Dash barked to wake me up to let me know when it was time for a flip. He would then get maybe a snack or drink of water before going back to sleep. But over the last week, he developed severe bedsores that became unmanageable. Greyhounds have very thin skin and these sores got to be very bad, very fast. We could not put him through that situation. On Tuesday, Dash went to be with our other human and furry family members who have passed on. We will miss him greatly. My wife and I have cried many tears over the last few days. I don’t mind admitting that my emotions get the best of me at times like this. I held it together pretty well through writing this tribute, until I uploaded the photo. It is one of our favorite images of Dash, showing his personality. It is the photo you often see on my blog and Facebook posts. It never becomes easier for us. Our household typically includes around 10 rescues – from older dogs to right now a younger lab-basset mix and lab. We have a basset-beagle mix who is probably around 15 to 16 years old and another greyhound, Jojo who is cancer survivor (osteosarcoma). At times such as this, our other rescues give us strength to go on. We know they need us and we need them. And we know that while we rescued them in one sense of the word, they rescue us, everyday, in other ways. I wish I could somehow make people who say “you don’t know what you get when you rescue a dog or cat” understand how totally wrong they are. Goodbye Dash. We will miss you – your strength, your will to live and your unconditional love. This entry was posted in Canine Cancer, Greyhound Racing, Saying Goodbye by jtgrady. Bookmark the permalink. Oh Tom, I am so, so very sorry!! My thoughts and prayers are with you all. I am so very sorry to hear about the loss of your precious Dash. 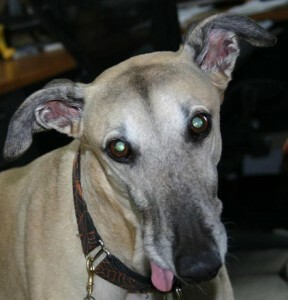 I have lost 4 rescued greyhounds since I began adopting them in 2000. I have lost many other dearly loved furry companions over the many years that I have always had some with me. It always leaves such an empty sadness but at the same time I know it makes room for one more who desperately needs a loving home. Those people are actually right…..they don’t know what they would be getting…. the unconditional love, the appreciation, the loyalty, the companionship, the humor, the enjoyment, the fulness in your life, the satisfaction ……..and who can receive a more heartfelt greeting of “so glad to see you” when you come in, even if you have just been gone 3 minutes totake out the garbage. Yep….they just don’t know. How very sad. God bless all who care for our fellow earthlings! Your words say it all. It never does become easier for us. So sorry to hear about Dash. He was a lucky dog, because he got to know unconditional love, comfort and safety. Thanks for taking such loving care of him. I know how hard this is. As an English teacher I know that sometimes there are paths we must walk so narrow even words can’t accompany us. You and your wife must walk one of those now, but know that our thoughts go with you and that Dash stays with us. The sadness will eventually turn to fond memories and the pain will be replaced by the echoes of joy he brought to your life. Thank you everyone for your kind thoughts about Dash. We really appreciate it. I am so sorry for your loss. I know Dash was very special to you. May you find some comfort knowing he is now running again like a pup after crossing the Rainbow Bridge. You and Nan are in my thoughts and prayers. What a lovely tribute to a special dog. Thanks for sharing Dash’s spirit with us. We can learn so much from our dogs’ bravery and integrity. What a marvelous dog Dash must have been! A true blessing to his human family, and such love and dedication you gave to him as far as he could go. I lost a mini Dachshund, age 18, in March, and I was invited to write a tribute to her in a Greyhound publication, and I couldn’t even find the strength to stop crying long enough to think of words which can’t describe what she was to me. She had 2 white greyhound sisters who are a sheer delight, and a sister chihuahua. Your tribute was written, I’m sure, through tears, but you did it and you did a beautiful job for your dear Dash. Thank you for doing more for Dash when he became ill than most people would. I think Dash and his Daddy are a pair made in Heaven, and I believe we’ll be seeing our Greyhounds and other dogs when we leave this earth.